Today’s passage picks up the day after Jesus filled the bellies of 5,000 with five barley loaves and two fish. But their stomachs were empty again, so they ask, What miracle do you have for us today? 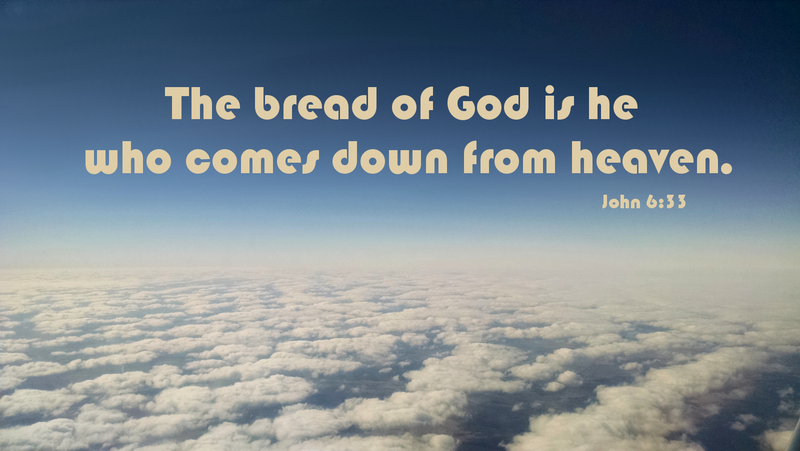 Moses gave our fathers bread from heaven every day for 40 years. Jesus is quick to correct them: Moses was not the miracle worker, but my Father. And that bread wasn’t simply to fill your stomachs; it pointed to me. My Father saved the true bread for you. The crowd misses the point, concerned with their grumbling tummies. But Jesus still offers himself “for the life of the world.” He still offers himself for you. No matter how much we try to satisfy our cravings with the things of this world — money, television, fame, family — eternal satisfaction will elude us. That’s why Martin Luther wrote, “The remedy for curing desire does not lie in satisfying it, but in extinguishing it.” Through his death on the cross, Jesus frees us from all of the false idols that draw us away from him, for Jesus alone is the object of our every desire, and only he can nourish our souls. Prayer: Father, we thank you for assuring us that you are for us and for the life of the world, but most of all, for feeding us through the true bread of heaven, who quenches all desire, your Son Jesus Christ, in whose name we pray. Amen. Today’s devotion was written by Pastor Rick Capezza, Executive Director for Flood of Justice Ministries and Spiritual Care Coordinator at Auburn Crest Hospice in Boise, ID.